A few weeks ago, my husband and I were shopping for Australian wine in our favorite wine store. We were really impressed with the Hunter Valley wineries when we were in Australia, so we thought we'd see what Australian imported wine we could find. We like our wine sweet, so we specifically looked for wines in the dessert wine section. We bought one bottle of Moscato (our favorite type of wine), which we drank later that weekend. I don't remember the brand, but it was pleasant, not spectacular. We also bought a bottle of R.L.Buller & Son Premium Fine Muscat, and we just got around to opening it tonight. It's imported from Victoria, Australia, and like many other dessert wines, it's a half bottle, which is plenty. The lid is a screw-top instead of a cork, which may not seem classy, but it's certainly practical. A screw-top bottle also seals better than a cork. I'm not against embracing technology. 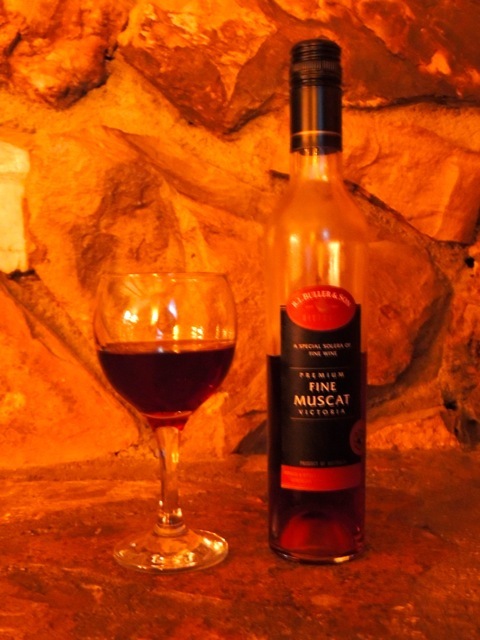 The Muscat has a high alcohol content for wine at 18%. This is intended to be sipped. It is also very sweet. It's like drinking candy. In short, it's a really delicious and flavorful dessert wine. When in Australia, my husband and I bought a bottle of Muscat that reminded me of this Muscat. It's nice to know I can find a similar taste close to home. Chick-fil-a - New Cobb Salad!